Every mom loves cute, colorful bowls to brighten up the kitchen. These Brilliant Lace Bowls are wonderful pottery painting ideas that utilize both cheery colors as well as lace, resulting in kitchenware that is both dainty and delightful. These bowls would look lovely on display and can really cheer up the breakfast table. Pastel colors are great painting craft ideas that should be used at any time of the year. 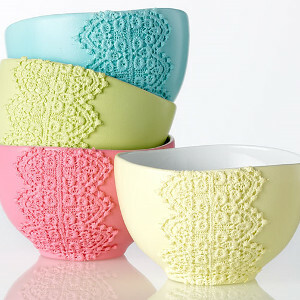 Make a set of Brilliant Lace Bowls for yourself and give one to your mom or a friend as an adorable gift. Wash and dry bowls with soap and water. Clean bowls with rubbing alcohol and let dry. Measure and cut lace to fit down side of each bowl. Following directions on the decoupage finish, apply the lace down the side of each bowl as shown. Let dry completely. Following directions on spray paint kit-Mix first color. Cover area and place bowl upside down on surface. Spray solid color as shown. Wash and dry sprayer and mix next color. Spray each bowl a different color as shown. This is brilliant and a fun way to give life to that set of bowls. I would have never thought of doing anything like this to a bowl but I do like how they look. Just a few coats of paint and they're ready to use. I don't know if you can use them in the microwave but I do know they're probably better off as fruit bowls. Oh my these lace bowls are so llovely and woulld make some great gifts for a bridal shower,birthday gift,Mother's Day, housewarming or just for yourself or someone special. I love the look. I will be making a lot of these once I get the hang of it. I think I may even do the lace a darker or lighter color to give it that pop. Nice tutorial. Looks very simple. Thanks. How could I even use these pretty lace bowls. I would love to use these bowls during parties and other special occasions. Using lace with bowls is a different look. As an alternative to attaching actual lace, you could use a very stiff and open lace weave as a stencil, and make the impression of the lace on the outside using another color or the lighter or darker version of the same color family. This would be a neat way to use lace tri used in a bridal,gown that could carry a little souvenir of the dress to each of the bridesmaids as a gift. Fun project! I'm guessing they are food safe. But we wouldn't be painting the inside of the bowl. The extra touch of that lace, colored/painted to decorate the bowl makes a sweet and vintage look. How cute if you are in charge of the bridal shower- put this on each table with those pastel butter mints with a silver spoon for serving. Yay! These bowls would make an adorable and inexpensive gift for someone. They look very easy to make and still look like a substantive gift to give. Look forward to trying this out. This is a perfect way to have really cute bowls without having to spend a bunch of money! My only questions would be how the lace would hold up when you need to wash them? Would that even be an issue? Wow! This is a brilliant idea. I thought at first I needed to crochet those lace decoration on the bowl but no, they are ready-made lace that can be adorned on the side of the bowls. This is really good taste. Thanks for sharing.